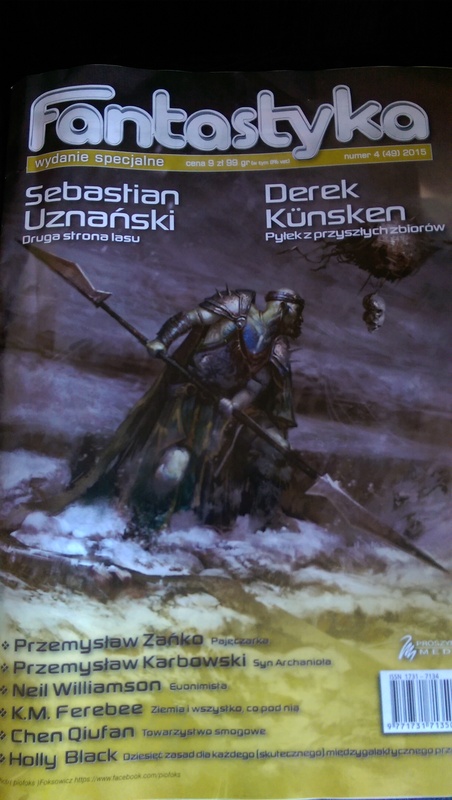 T he new issue of Polish SF & F magazine, Fantastyka, contains a reprint of my story, The Euonymist. There’s something other-worldly about seeing your own words printed in a different language; a language you can’t even read. You can sense the shape of the story, perhaps spot a few phrases and make a guess at which bits are which, at the same time being aware that there can never be a direct word for word mapping because to articulate your sense and nuance, the translator has used phrases and idioms appropriate to a their culture, not yours. That’s particularly true in the case of this story, which is about that very thing: the nuances between languages, and concepts that can only truly be represented in their native tongue. I think the Poles and the Scots must be fairly close in their outlook, because a result I now know that the Polish word for “scunner” is skundra. I’m in awe of the work translators do, and am hugely grateful to Krystyna Chodorowska for taking this story on and pitching it to the magazine. And I’m really chuffed that my first translated story appears, in Polish, in the pages of Fantastyka.